Project management is the broad process of organizing and controlling resources to achieve a specific project outcome. Different types of projects will have quite different outcome expectations, and the resources involved in various types of project management will differ greatly. For example, the successful management of a construction project will involve allocation of labor hours through employees, contractors or subcontractors. It will require careful planning to obtain the necessary permits and approval for all designs and specifications. The delivery of materials must be coordinated with project needs, and equipment must be available for use when needed to avoid unnecessary delays. Many of these issues are tightly intertwined with cash flows since the funds for the construction of a large structure are often not made available all at once. In the IT world, project management typically refers to the production of new software. This type of project hinges almost exclusively on control of a budget and management of personnel. Projects are temporary and require different management techniques than day-to-day operations that produce goods as part of a business’ routine operations. Projects are usually on more rigid schedules, and the availability of materials is more of an issue. It is true that day-to-day production also depends on material supplies, but the supply chain has usually been perfected through experience on activities that are performed on a quotidian basis. The temporary nature of projects precludes the same efficiency from repetition. 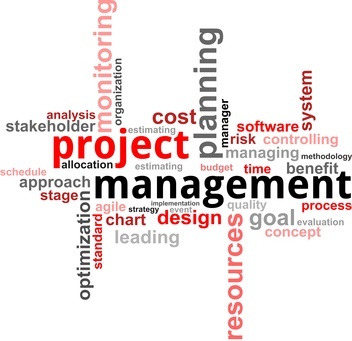 Many models of project management have been developed over the years. The most basic model is the traditional, phased approach. In the traditional approach, five distinct phases of a project are identified and implemented. The first phase, which typically involves financing, is the initiation phase. The second phase is the planning and design of the project. The third phase is execution. This is the step that most people think of as “the project” because this is when construction activities occur. The monitoring phase occurs simultaneously with the execution phase. The fifth and final phase is the completion of the project. Critical chain project management is a model that focuses on the limitations of the resources needed to execute a project. Tasks are identified as either critical events or non-critical events, and critical tasks are given priority over non-critical ones. Project resources are managed to ensure that critical chain tasks start and complete on schedule. Lean project management focuses on minimizing waste while completing the project. This model was derived from lean manufacturing techniques, and the basic concept is that projects that complete with less waste are more efficient and therefore more profitable. This is an increasingly desirable model in a society where minimizing carbon footprints and environmental impacts are prominently advertised as a marketing strategy. It is common for a company to manage multiple projects at once. Project management models based on critical chain management techniques do not work well when multiple projects are being managed simultaneously. It becomes too difficult to compare critical chain tasks from different projects and assign priorities when multiple projects are being conducted. Extreme Project Management is designed specifically for complex and uncertain projects, and it deals with the complexities of prioritizing phases of unrelated projects well. It is a very open, flexible model that focuses primarily on motivating human resources allocated to a project. These are just a few examples of the many models, that have been developed for project management structures paper. The model that is most suitable to a particular project will depend upon the type of project, the particular project constraints, the environment in which the project will be performed and the required project outcome.